In only a few minutes, this compact device can be attached to a liquid CO2 cylinder and will produce a ready-to-use 250 – 300 gram block of dry Ice. (Each 50 lb. cylinder makes from 10 to 16 blocks of dy ice). Set-up and use is safe and simple. Dry ice production can be viewed through the transparent polycarbonate body that secures without clamps or screws or tools ensuring easy removal of the solid block of dry ice and connection from the CO2 cylinder. A rugged nickel plated “pigtail” connects the Frigimat® Cub – Dry Ice Maker to the CO2 cylinder valve. The system operates at very low pressure (displayed on the built-in dial gauge) and incorporates multiple pressure relief safeguards. Cylinder Connection: 1.8m (6 ft) nickel-plated copper connecting tube with standard CGA 320 thread coupling for easy attachment to a CO2 cylinder. Prevent costly, time consuming sample loss with this practical battery operated system. 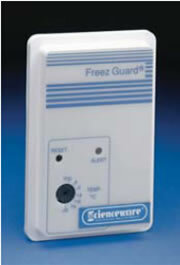 The FreeGuard™ Alarm monitors freezers and coolers and detects any variance from temperatures between -20°C and 13°C (-5°F to 55°F), ±1°C, which are preset by the user. The resonant alarm will continue to sound for up to three days if the temperature falls out of the pre-set range. Should the temperature correct itself, an LED will indicate that a variance has occurred. The alarm can be reset manually. A beep will signal when the 9V battery (not included) is low. For added protection, and extra life, a second battery can be connected. The unit mounts with self-adhesive tape or screw. 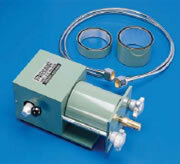 Unit comes with a 3 meter probe lead, and measures 86W x 35D x 26mmH (3-5/16 x 1½ x 5-1/16). The weight without the battery is 144 g (5.1 oz). The Frigimat® Dry Ice Maker eliminates the need to buy large quantities of dry ice when only a few blocks are needed. It employs the Joule-Thomson effect to produce a solid 454 gm (16 oz.) block of dry ice in one to two minutes. A brass relief valve safely vents excess gas. Removing the dry ice block requires just 30 seconds. Each 50 lb. cylinder of liquid CO2 will make 8 to 9 blocks of dry ice, each measuring 8.5cm (3⅛") x 11cm (4⅜"). The unit is made from epoxy-coated steel with an aluminum ice chamber and brass valves with four non-skid rubber feet. Dimensions are 30 x 17 x 13 cm H (12 x 6½ x 5"). Shipping weight: 5.5kg (12 lbs) and includes a 1.8m (6 ft) nickel-plated copper connecting tube with standard GCA 320 (0.830" – 14) thread couplings for easy attachment to an LCO2 cylinder.